It's news that many will view as long overdue. Nixxes - the developer responsible for Shadow of the Tomb Raider on PC - has announced that the game now supports NVIDIA RTX features. Update 1.0.280 (Patch #13) is now available on Steam, and in many cases will be automatically applied. It was seven months ago that Shadow of the Tomb Raider served as one of two NVIDIA RTX showcase titles at Gamescom2018. Early hype for the new advanced ray tracing features - then exclusive to NVIDIA RTX GPUs - served as a driving force behind early RTX 20-series sales. However it soon became clear that actual in-game support wouldn't be arriving at the game's launch. Nor on RTX 20-series' availability. Nor when Microsoft rolled out Windows 10 October update to enable DirectX Raytracing. 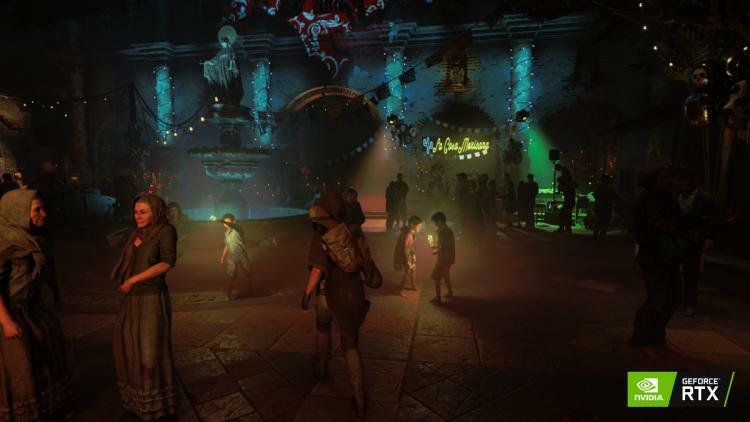 All told, those who bought the game at launch will have waited six months for real time raytraced shadows to be included, one of the game's marquee features. Many will have completed the game and long-since moved on, no-doubt a little put out considering hundreds of pounds would have been spent on cutting-edge GPU hardware. Such is the pain of the early adopter. Alongside RTX ray traced shadows comes NVIDIA DLSS, the controversial machine learning-based upscaling technique that requires hardware components also exclusive to RTX 20-series cards. This should serve to improve performance to configurations struggling with achieving a consistent 60fps in the new ray traced workloads at full monitor resolutions. It remains to be seen whether the degradation in image quality is worth the FPS boost, or if users will be asked to 'wait for additional DLSS neural network training' as recently occurred with Battlefield 5 and Metro: Exodus. - Nvidia’s latest drivers 419.35 and up. Earlier this week NVIDIA announced plans to support limited DXR ray tracing features on selected GTX 10-series and 16-series graphics cards. At this point it is unknown whether Tomb Raider will be among the titles to also reflect this support on older cards.